This article describes a simple java tool for recording and replaying MySQL queries while measuring their execution times. The replay mechanism makes the measurements comparable across different environments. Why do we need another benchmarking tool? What's so special about this one? It's capable of reading and replaying MySQL's 'general query logs', not 'slow query logs' and not tcpdumps. Percona Playback in version 0.3 doesn't supports 'general query logs', version 0.6 seems to also support 'general query logs'. It's measuring execution times of all queries and aggregating identical executions. pt-query-digest supports general query log, but only without measuring execution times. It's written in pure Java, making it the most realistic way of running queries against the server if you're developing a Java application. It's small and easy to use, not a full blown full featured benchmarking suite. It does not offer advanced filtering methods, just restriction to connection ids and prefix matchings. Measurements can be exported in either CSV for easy Excel import or in JETM-Style. In some cases, it's necessary to run a simple single-component benchmark on a MySQL server. In opposition to a full-stack benchmark, a single-component benchmark only targets the isolated database. It can easily be modified to target the network connection, too. The benchmarking strategy presented in this article, records all queries during a real application run. Using a simple benchmarking tool written in java, allows you to re-run all recorded queries multiple times and record all query runtimes. Besides slow query log and the built in profiling mechanisms, MySQL offers the often unnoticed general query log. You can use this mechanism to log all queries which run while executing various use cases in your application. My idea was to use the general query log to re-run all queries on the MySQL server and measure their timings. This enables me to reproduce the same use case multiple times on the same or on different MySQL servers or in different network configurations. Measuring the performance based on the same query execution makes measurements comparable. 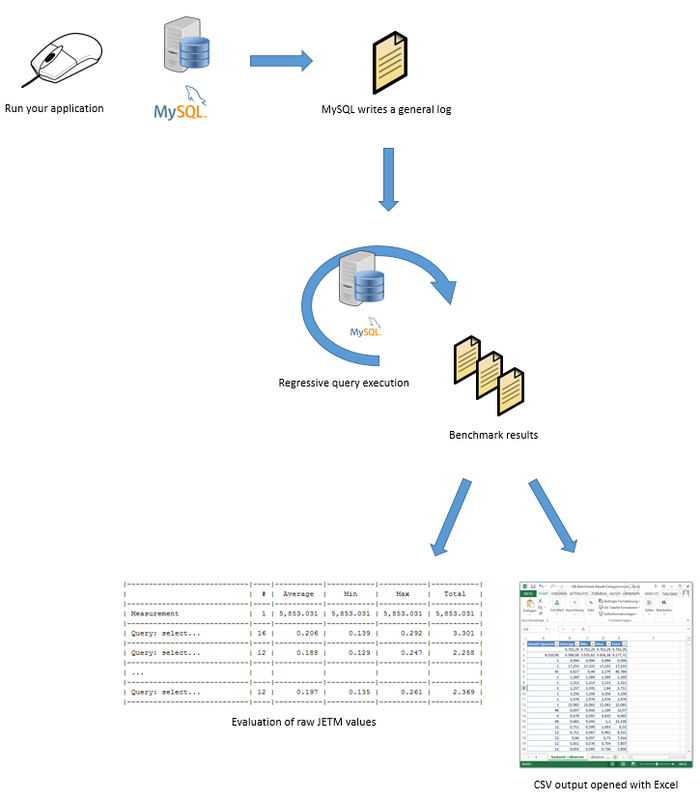 The following picture shows the whole benchmarking strategy in a sequential process: You execute a use case in your application with enabled general log in mysql. You can use this logfile to re-run all queries which were executed on the server during your usecase. The benchmark results can be viewed as text files or evaluated after an Excel import. All I needed to do is writing a small tool which is able to parse the general log file and re-run all queries against a configurable mysql server. The output should be configurable in JETM-Style or csv-format which allows me to see all query timings in average, min, max, total and the count of each querie's excution. This method works on any platform and does not require a server restart. MySQLQueryBenchmark is a java console application, taking a slow query log, executing the contained queries and returning their execution times as JETM-measurements or in csv-format. The results will be stored in results.txt in JETM-Format by default. If nothing different is specified, localhost:3306 is being used as mysql server. There are useful command line options which allow you to only execute specific queries, which match a prefix or are logged under one connection-id. This file can easily be opened in Excel for further evaluation. As a developer, I cannot resist telling you how the tool is implemented. For csv output, I simply created a class CsvRenderer derived from JETM's MeasurementRenderer. I used the SimpleTextRenderer as template and adjusted it to generate a csv output. This tool is open source under Apache License, Version 2.0. Enjoy benchmarking with this tool. Thanks for this. Interesting that you point out that it's capable of reading and replacing MySQL's 'general query logs.' Are there other tools that can do this? It seems like a function that the software developers would think to program in.